crafting with katie: MCT Scrapping the Little Things! Today on My Creative Time, we are "Scrapping the Little Things"! This is our chance to show off what we're doing with Project Life, SMASH Books, etc. I started doing Project Life at the beginning of the summer, and I am loving it! The My Creative Time stamps and dies are just perfect for adding fun details to my layouts. Today I'm sharing a layout of my friend's wedding. I had a lot of fun with this one, especially since I got to use girly colors (my son is 17, so this is not usually the case in my Project Life). My friend had some hot pink flowers in her bouquet, so I played off of that. My Cricut Teddy Bear Parade cartridge arrived the day I was working on this, so I couldn't resist using the bride and groom cuts! I cut them at 3 1/4" and used Peachy Keen Large Critter Faces for their cute faces. To spell out the bride and groom's names and the date, I used the alphabet and numbers included in the MCT Just Simply Live stamp and die set. I love that font! Isn't this a gorgeous picture? I pulled this one off of Facebook; it was taken by another guest. 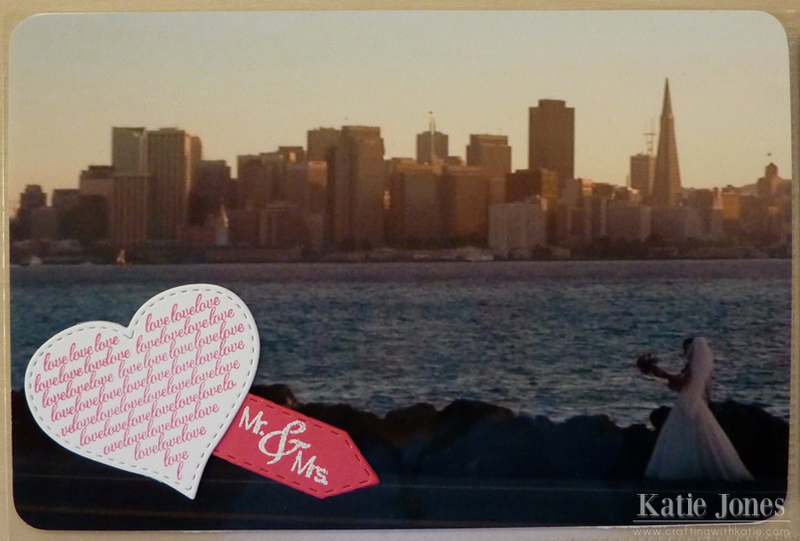 The wedding took place on Treasure Island, in the San Francisco Bay. I love the backdrop of San Francisco here! I have to say, I just realized that I have no pictures of the groom!!! But if you look closely, a little bit of him is showing behind the bride in this picture, LOL! I added a little "Mr. & Mrs." tag made with MCT's Teeny Tag Greetings (heat embossed with white embossing powder) and a heart from MCT's 100% Sweetness. This is a Valentine's set, but it works great for weddings too! The "LOVE" stamp is also from 100% Sweetness. I heat embossed it with gold embossing powder to really make it pop! 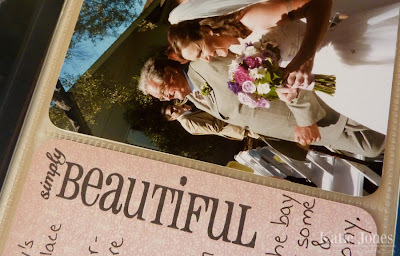 This "Simply Beautiful" sentiment from MCT's Camera Shy is so elegant, and perfect to have next to a picture of the bride and her dad. Finally, I was so happy to get a great shot of my friends and me. I work with these lovely ladies, and we have the best time together! 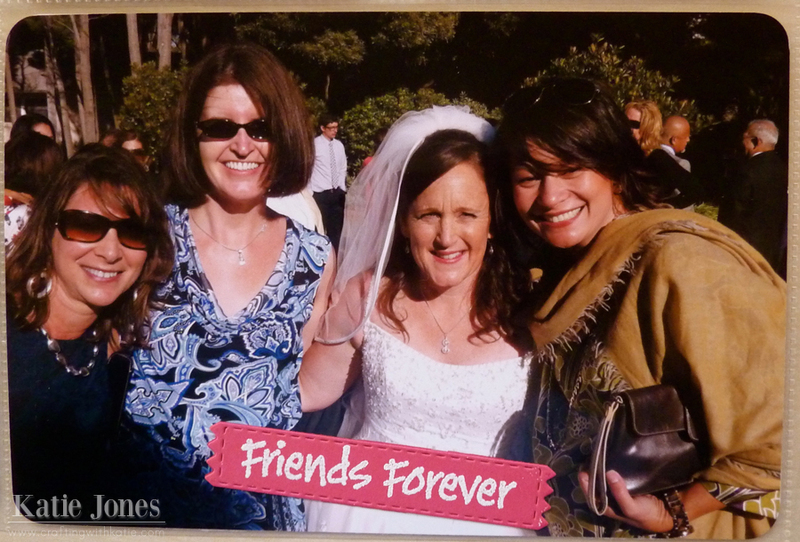 I used a stamp and die from Just Simply Live to get my cute "Friends Forever" tag. Now, be sure to click on the link below to head over to Emma's blog to see what she and the rest of the design team have scrapped for you today! katie, this is such a beautiful layout, it shows the love you have for your friends! oh and those little bears are too stinkin' cute too! Wonderful PL page! Love all the little details! Love this page. Those bears are perfect to capture the moment. Your pages are so nice. I checked in to the stamps that you used and they are great. Gotta' get some of those!! I likes how you transitioned the Teddy Bear cart into your pages. It is a great cart. Thanks for sharing your special moment with us!! Love those teddy bears. Beautiful picture of San Francisco in the background too. What an awesome layout Katie... you are so amazing girl.. you just never cease to amaze me. Those bears are so adorable..
Wow this is beautiful. 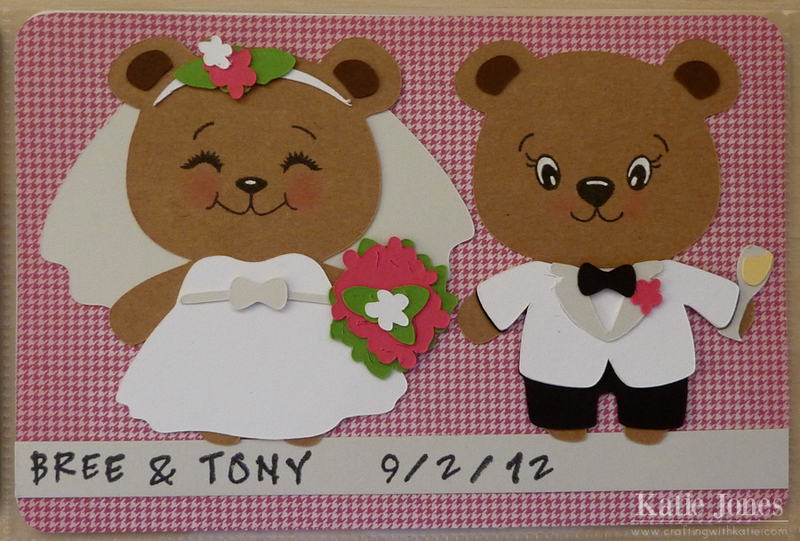 The wedding bears turned out so sweet. Awesome page, Katie!!! Love your PL page!!! You did a wonderful job with placement and the colors are perfect! Oh and the photos are beautiful of course!!! Great job Katie!! What a great job on your layout! 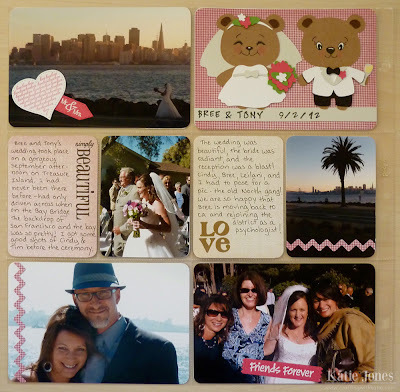 I love the bears with their cute peachy faces :D Adding the zig-zag, heart, tags and embossing the LOVE is perfect quiet embellishments that keep the focus on the people and pictures. Love it! That looks great!! You did an awesome job on the bride and groom! !